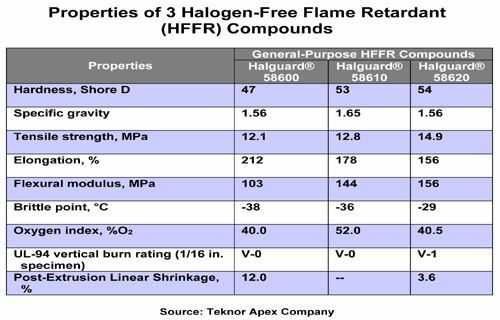 PAWTUCKET, RI, U.S.A., April 20, 2015: New additions to a low-cost series of Halguard® halogen-free flame retardant (HFFR) compounds for general-purpose jacketing applications include two compounds with enhanced flame retardance and one that exhibits lower post-extrusion shrinkage, it was announced today by Teknor Apex Company, which will introduce the compounds at Interwire 2015 (Booth 212). ● Halguard 58610 and 58615. These 53 Shore D compounds have UL-94 vertical burn ratings of V-0 for 1/16 in. (1.59 mm) thick specimens, and oxygen indices of 52 and 45%, respectively. Both enable passing the UL-1685 FT-4 and UL-1666 riser flame tests for more complex cable constructions. ● Halguard 58620. This 54 Shore D compound provides the low level of post-extrusion shrinkage that is important for fiber optic cable applications and enables passing the UL-1685 flame test. 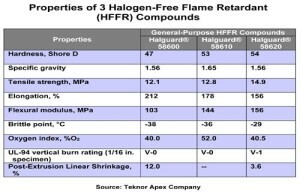 The new compounds follow last year’s introduction of the first compounds in the low-cost HFFR series, Halguard 58600 and 58605.